No more scrambling for something to bring to the holiday potluck. These simple dishes serve a crowd (and barely make a mess in your kitchen). The word ‘casserole’ may conjure up not-so-tasty memories of your mom throwing noodles, meat and sauce into a baking dish to create her famous “Casserole Surprise.” But with the rise in popularity of one-pot recipes, casseroles are making a comeback in a big way. This simple dish delivers on flavor and aroma. Just one skillet is required to brown the chicken and then simmer in a tomato bath. Garnish with parsley and olives for a fresh and salty bite. Make it in a cast-iron skillet, cover with aluminum foil and bring it straight to the party. When you arrive, just simmer it for 5 to 10 minutes on the stove-top to warm it up! While most baked casseroles include some sort of pasta or grain, this recipe uses cauliflower rice instead. Perfect for vegetarians, this casserole is packed with meatless protein from the black beans and cottage cheese. Admittedly, roasting the sweet potatoes ahead of time adds about 20 minutes to the prep work, but you can omit the tubers if you’re short on time. Best of all, this casserole can be made days in advance and reheated when it’s time to eat! This one-pot meal cooks chicken, pasta and veggies in one pan. Simply start by cooking the chicken in a skillet, then add the sauce, pasta and veggies and you’ve got a flavorful one-pot meal in 20 minutes. Not to mention that a box of pasta is extremely affordable and can feed a crowd. Throw this in a Tupperware to bring to the party or transport it right in the skillet. If you’re looking for a simple, customizable meal to please vegetarians at the party, look no further than this meatless enchilada casserole. The recipe calls for zucchini, mushrooms, bell peppers and onions, but you can sub in whatever type of veggie suits your fancy. The same goes for the type of tortilla — flour, wheat or rice work just fine. Bake it all in a casserole dish and bring it with you to add some spicy flair to your next potluck. Don’t let the name scare you off: This one-pot meal is extremely straightforward and a real crowd-pleaser. A traditional Spanish tortilla is baked eggs and potato, but this one also includes asparagus for a hint of color and texture. This recipe may seem too simple for a party, but pair it with a baguette and everyone will be asking for seconds. Plus, anything looks fancy when you serve it right out of a cast-iron skillet. Grab your food processor and baking dish for this incredibly tasty vegetarian buffalo dip. No potluck party is complete without a cheesy dip, and this one does not disappoint. But there is a little secret: it’s actually quite healthier than the traditional buffalo dip because of some easy swaps. 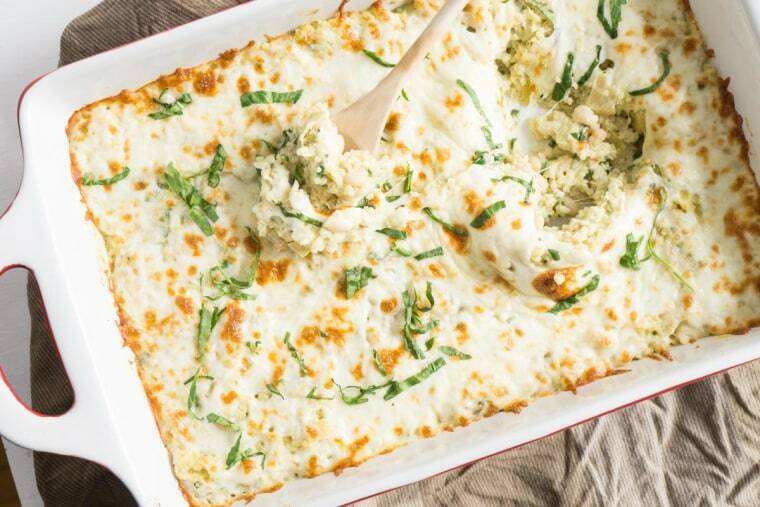 Use cauliflower instead of chicken, Greek yogurt in place of cream cheese and cut back on the cheese. Not only is this dip spicy and cheesy, it’s vegetarian, gluten-free, fiber-filled and satisfying. This Indian-inspired dish cooks in the Instant Pot, and it’s sure to stand-out from the standard casseroles at the potluck. Coated in aromatic spices, yogurt and lemon juice, the chicken is juicy and is accompanied by nutritious veggies, like cauliflower and tomatoes. You’ll need about every spice in your cupboard to make the orangey red sauce, which is sure to be showstopper. Is this one pot cheesy dish a dip or an entree? You decide. It combines cooked quinoa with feta cheese, milk, egg, spinach, artichokes, beans and white wine and it’s all topped with mozzarella cheese. While you can eat it right out of the pan with a fork, it pairs really well with some toasted French bread. Either way, it’s all baked in a casserole dish and is easy to transport to any party. Just reheat, serve and let your guests decide how they want to eat it! If you’ve never had tagine before, let me introduce you to your new favorite dish. It gets its name from the cooking vessel, the tagine — a North African clay pot with a wide bottom and conical top. Luckily, the home cook doesn’t need a tagine to mimic the flavors. Instead, all that is required are some veggies and spices. Cook them all up in one pot until they reach a stew-like consistency and serve with rice. This mouthwatering dish will not only be the hit of the party, but sharing the fun facts about the tagine makes some stellar small talk. If you’re going to a party, but you don’t have time to cook all day, break out the slow cooker. Just throw beans, veggies and spices into the slow-cooker, go about your day and swing by after work to grab the cooked dish and some tortillas to bring along to the fiesta. This recipe calls for unique taco toppings, like walnuts, avocado, cabbage and lime, but feel free to switch it up and use any ingredients you have laying around, like jarred salsa, sour cream, Greek yogurt or shredded cheese.